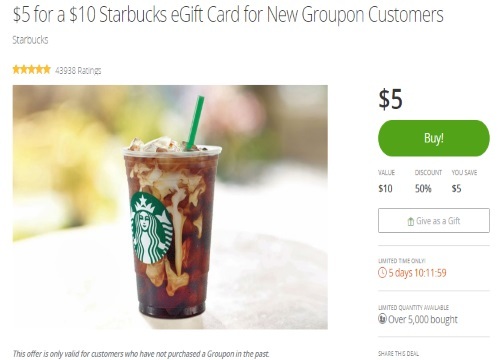 Groupon has a sweet Starbucks deal today! Get a $10 Starbucks eGift Card for only $5! This offer is available to new Groupon customers only that were invited to this offer, please note this is for those who have not purchased a Groupon in the past! Limited quantities are available. Limit 1 per person. While this offer reads US only, in the past I have been able to use Starbucks offers from Groupon with no issue at all in Canada. The funds are in US, so you get more bang for your buck using it in Canada anyway, so extra bonus there.